The First Birthday party for your child is a special occasion, but it can also be one that new parents may dread! Here's some advice on how to throw the perfect 1st birthday party! A good thing to keep in mind when planning your child’s First Birthday, is that the day holds much more meaning for the parents than it does the baby. You don’t want to overwhelm the child with too much activity, so it’s a good idea to keep the party very simple and low key. For a baby’s 1st birthday party, it’s best to only invite close friends and family – people who the child is already accustomed to. The child will still understand that it’s a special occasion, and may even understand that the party is all about them, but you don’t want to introduce too many unfamiliar faces as it might unsettle the child. If older children or siblings are present it should be explained to them that the baby’s party will be quieter than other parties they may have been to. Arrange activities for the older children, but also let them know that they may have to wait for the baby’s naptime before they can begin certain games and activities. Keep the length of the party to a minimum if possible – one to one and a half hours is a suitable length for a one year old. A good idea is to hold the party before your baby’s regular sleeping time, as the excitement alone of something new is enough to tire them ou. While you want the day to be special for your child, you also don’t want to wear the child out or cause him or her any discomfort. Party themes, while fun, are much more suitable to children who are aged 4 or over. Any younger than this, and children may become confused by too many surprise elements. Try to avoid new foods for your baby on this day - or limit it to one - in case there may be a reaction and it will be hard to determine the cause if there've been a few new foods sampled. It might be an idea to provide finger food that the child can also enjoy, then perhaps serve an adult dinner soon after the child is sleeping. This can be a good idea as it not only makes the party interesting for your guests, but also gives the parents a chance to unwind with their friends. Many parents can often miss out on the chance to socialise, what with their baby’s busy schedule, so this not only gives everyone a chance to celebrate the child’s first birthday, but also for the parents to catch up with friends and family on the occasion. The Birthday Cake is a great tradition for any celebration, but at this age the cake is mostly for the adults benefit. If your child/children can't eat the cake - make sure they can have a treat, such as custard, frozen yoghurt or non-dairy treat instead. There are many alternatives to cake that can be just as exciting for the child. You should always be aware, no matter what age people are at a party, that certain foods can cause allergic reactions. Always check with others beforehand to see if invited guests are allergic to any foods. In the case where certain guests may suffer from food allergies, it’s a nice idea to make sure the food that’s provided can be eaten by everyone who is present at the party. Aside from the risk of a child or guest accidentally eating food they shouldn’t, this also ensures that no one at the party will feel left out. A good idea is to introduce your child to a small few candles. You can do this by setting them in a muffin or cupcake. You still want your child to experience the excitement and wonder of their birthday, so keep in mind that you don’t want to overplay it so that it’s still exciting for them come their actual birthday party. A child will also be very curious about Birthday Candles and may want to touch them, so be sure to set the cake well out of reach from your one year old – at least until the candles have been blown out and removed. When the cake is brought out, you and the guests will no doubt want to sing the “Happy Birthday” song. It’s also a nice idea to introduce this song to your child in the weeks beforehand, so they’re very familiar with it. Children at this age are very responsive to repetition, so it should be easy to familiarise you child with this song. Begin by softly singing this to your child during times that the child’s familiar with already, such as bath time or when your getting your child to sleep. It might help to soon after have both parents singing it at these times, singing it a little louder each time the song’s repeated to accustom the child to the future group performance. This way the child can enjoy having the Birthday Song sung to them, but won’t be startled when it’s performed by a larger group of adults. You have to remember that your child’s the smallest guest there – it could be quite confusing to suddenly have grown-ups breaking into chorus without warning. Ideally, you want to stick to the rule of keeping things simple for the child. 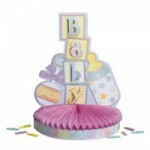 Being bombarded with numerous gifts can also be overwhelming for a baby. As it’s the First Birthday of the child, perfect gifts can be those that mark the special occasion – giving both the child and the parents something to remember as years go by. This can be as simple as a special book or a Teddy Bear that family and friends can sign, congratulating the baby while also leaving a keepsake for the family. A nice idea for presents can sometimes be to give gifts that are suitable to both parents and child, something that can help make it easier when looking after a baby. The quality and ease of the time a parent spends with their child can be just as valuable as toys.